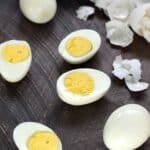 These Instant Pot Hard Boiled Eggs cook perfectly every time, and they are super easy to peel for snacks and appetizers whenever you need them! Place trivet at the bottom of the inner Instant Pot pan. Place eggs on top of trivet, stacking evenly if necessary. Add one cup of water to the pan. Close the lid and set Instant Pot for 5 minutes on Manual at HIGH pressure. Scoop eggs out of pot and place in an ice bath for 5 minutes. Remove from the ice bath and peel or store in the refrigerator until ready to use. I used my 6 quart Instant Pot®, and the trivet that comes with it. Place a dish towel over the vent when you release the pressure/steam or you may burn yourself! Gently push on the vent and release the pressure in short bursts. I cooked 12 eggs, but I “believe” that you can cook more using the same exact times above. I will give it a try and report back with the results.